In medium bowl, mix flour, granulated sugar, baking powder and salt. Stir in milk, 2 tablespoons butter, the vanilla and eggs. Beat with wire whisk just until smooth. Lightly butter 6- to 8-inch skillet or crepe pan. Heat over medium heat until bubbly. For each crepe, pour slightly less than 1/4 cup batter into skillet. Immediately tilt and rotate skillet so thin layer of batter covers bottom. Cook until light brown. Run wide spatula around edge to loosen; turn and cook other side until light brown. Repeat with remaining batter, buttering skillet as needed. Stack crepes, placing waxed paper between each; keep covered. 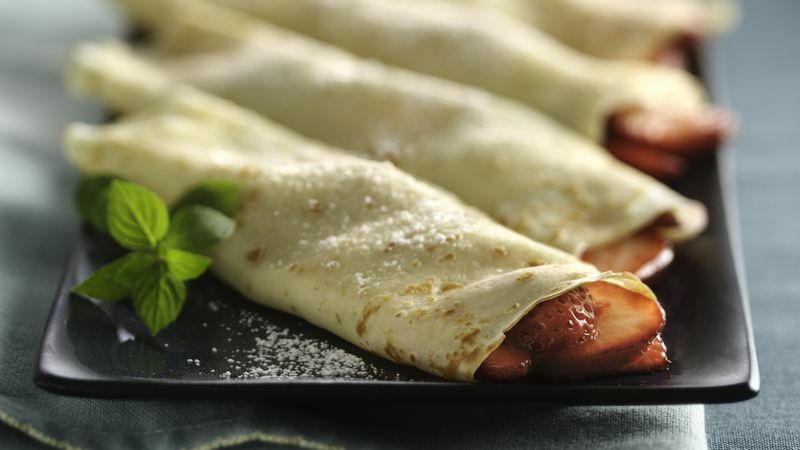 Spread applesauce, sweetened berries, jelly or jam thinly over each warm crepe; roll up. (Be sure to fill crepes so when rolled the more attractive side is on the outside.) Sprinkle with powdered sugar. Make crepes as directed and cool completely; do not fill. Stack crepes with plastic wrap between each; wrap tightly and freeze up to 2 months.